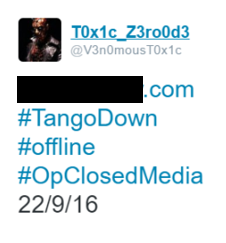 Hacktivists are threatening to launch #OpClosedMedia, a month-long cyber campaign against websites and platforms of “mainstream media,” on September 22, 2016, for failing to inform the public about the real news. The campaign’s official target list includes the websites of the BBC, The Daily Mail, The Independent, Reuters, Channel One (Russia) and others. Thus far, participants have claimed responsibility for hacking several websites related to the media sector from around the world, but they also claimed to have hacked other websites with a loose connection to this sector. This is not the first time that the media sector has been targeted by hacktivists. In June 2016, the Ghost Squad Hackers group launched the #OpSilence campaign against prominent news agencies, such as Fox News and CNN, protesting against what they called the “silence and lies” regarding the Palestinian situation. However, it seems that the Ghost Squad Hackers are not involved in this campaign. In conclusion, popular news platforms and the media sector in general are targeted by hacktivists who wish to shut them down. Only time will tell if they will succeed or not.